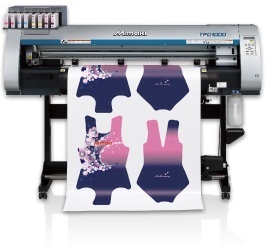 TPC-1000 | Product | MIMAKI SINGAPORE PTE. LTD.
TPC-1000 is a cutting-edge printer cutter engineered for the needs of present day and it achieves reduction of operation time while enabling unattended operation from printing to cutting. With TPC-1000’s dual role, your creative & “fashionable” ideas will come true! “I want to make more fashionable sportswear and apparels!” TPC-1000 is the best match to your needs! TPC-1000 combines two functions in one single machine, an accurate inkjet printer and Mimaki’s cutting technology. Powered by Mimaki’s printer cutter, your fashionable design will create new business opportunities in the sportswear and apparel industry. 3 types of software are included as standard according to user's experience and skill.